An entry by TravelMag.com writer Paul Joseph. – Jesse and Max from Alabama. – Emily Z, from the music duo Zigtebra. – Justin and Erik C. from Los Angeles. Buddy Banter and HABITS showing their appreciation for the adventure after playing a show together! E-mail I received from a happy customer. Mateo was completely awesome! We could not have toured to Tijuana without him! He set up an incredibly cool show for us, hooked us up with a place to stay, and took us on the most fun adventure-walk around the city! We saw the best tourist and locals-only spots, including an Oceanside sunset dinner, dancing at 3:30AM on a Sunday night, and best of all just exploring the neighborhoods. Mateo was gracious, funny, and cool to hang out with. THANK YOU!!! ❤ Zigtebra can't wait to come visit Mateo in Tijuana on tour again next summer! Mateo is the ultimate tour guide! My brother and I live in LA, and we had been to Tijuana before, about 4 years ago. We were ready for more of the same… cheap food and drinks mainly. Mateo showed us a whole new side of the city, and I see Tijuana in a very different light now. He brought us to incredible places that we NEVER would have found on our own! Coffeeshops, art galleries, microbreweries, punk shows, clubs, and even the beach! Yes, Tijuana has a beach, and it’s awesome! Mateo has a true love for the city, and knows all the best spots, with tons of interesting history to go along. This was one of the most educational vacations I have ever taken. Every time I thought we had seen it all, he would bring us to a new place that was even more amazing! Of course, we speak very little Spanish, so Mateo took care of translation for us. He helped us order food, buy things, and hang out with locals. It felt so good to be able to really interact with the city and the people, knowing that Mateo would be there to guide us and help translate when need be. Throughout the course of doing all this, Mateo made sure that we were getting only the best food and drink in the city, bringing us to a variety of restaurants and food trucks, both standard and gourmet. My brother is vegan, and Mateo made sure we would go places that had good food for him too. If you actually want to experience Tijuana, it is imperative that you choose the right tour guide. If you want a guide who is fun and relaxed, and will give you a REAL experience instead of just trying to make money, then you should definitely hit up Mateo. He will completely hook you up! We are planning on going back within the next couple of months, so see you soon! 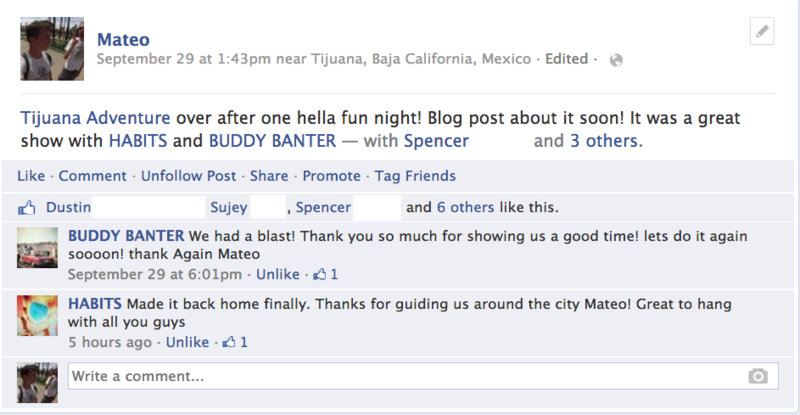 Mateo is the pinnacle of tour guides in Tijuana! He showed us delectable restaurants, the city, beaches, and all sorts of nightlife. Thank goodness he was there to assist with the language barriers. Take no visit to Tijuana without Mateo on your side! If your coming to Tijuana for a day or longer, Matt is the guy who can show you around. Since this is the place he calls home, you can bet he knows exactly what is going on in this crazy/amazing city. I met him for the first time in Tijuana and felt just as comfortable around him as my friends back home. He is a laid back and easy going. I would recommend his services to anyone. I am definantly going to hit him up again on my next trip down South. It has been over 10 years since my hubby and I spent time in TJ, so we were well over due to experience this exciting, bright city. We didn’t want to drive in Tiajuana, so we parked our car at Border Station Car park and a 15 minute walk later we were met by Matt (our tour guide). Matt showed us all over Tiajuana. We visited some fantastic restaurants, taco stands, breweries, bars, murals, shopping areas, the beach and even had an interesting stroll through the red light district. We stayed at Caesar’s Hotel (also recommended by Matt). The whole tour was unbelievably good, Matt is very friendly and just went out of his way to give us the best experience possible. 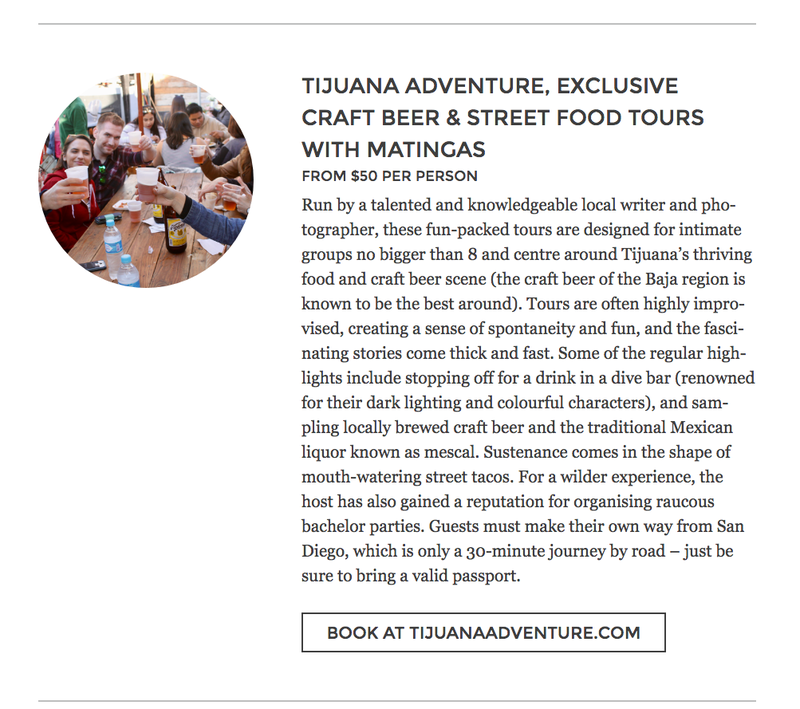 We highly recommend using Tijuana Adventures if you are planning a trip to Tijuana. They are the best and you will not be disappointed.